Gov. Rick Scott is making up some ground in favorability and in a theoretical 2014 match-up against Charlie Crist, according to the latest Quinnipiac University poll. Some 40 percent of respondents now view Scott favorably, up from 33 percent last March, with 42 percent seeing him negatively. It’s his best showing since becoming governor. His job approval rating is at 43 percent against 44 percent who disapprove. But when asked whether Scott deserves to be reelected, just 35 percent of respondents say yes, a small improvement over the 32 percent who did in March. Fifty percent say he does nto deserve reelection. In a match-up against Crist–who has not announced his candidacy in the race–Scott trails, 47 to 37 percent, but that’s a significant improvement from March, when he faced a 16-point deficit in the Quinnipiac poll, and a 12-point deficit in a Public Policy Poll. Scott would also lose against Sen. Bill Nelson, if Nelson were to decide to run for governor. He would beat Scott 48 to 38 percent. Some Democrats are pushing Nelson, who’s had his run-ins with Scott, to run. He was elected to his third U.S. Senate term in November. Florida Democrats gathered for an annual gala last weekend boasted that whoever they would field against Scott would win. Scott’s numbers have been climbing slowly but rather steadily since his lowest approval rating in May 2011, when it bottomed out at 29 percent, among the worst for any governor in the nation. Scott’s climb in the last year was characterized by a distinct shift left on some issues as he embraced a raise for school teachers, opposed tuition increases for college and university students, increased state spending to a record high, and backed what would be an ill-fated attempt to go along with an expansion of Medicaid within the framework of Obamacare. Republicans give Scott 74 percent favorability, compared to Democrats’ 12 percent. Independents, the swing voters in most Florida elections nowadays, give him 38 percent. His favorability among Hispanics is 34 percent, 19 percent among blacks and 44 percent among whites. Central Florida gives Scott his lowest job=-approval rating in the state, with 43 percent. Scott does better in the north and the Panhandle (51 percent) and the southwest of the state (61 percent). “For Scott to win, he will have to do better among Republicans than Crist does among Democrats, carry independent voters and drastically reduce his deficit among women. That’s a tall order, but there are 17 months until the election,” Brown said. Crist’s favorability is at 48 percent, with 27 percent from Republicans, 67 percent from Democrats and 49 percent among Independents. Crist’s favorability went from a high of 68 percent in February 2009 to a low of 47 percent last December before edging back up in June. The poll also asked the following question: ” In the last three years, Charlie Crist has changed his party affiliation from Republican to Independent to Democrat. Some people say this is a positive thing because it shows he is a pragmatist who can change with the times and issues. Other people say it is a negative thing because it shows he has no core beliefs. Which comes closest to your view of Charlie Crist?” 47 percent found it to be a positive thing, 44 percent found it to be a negative thing. The numbers were quite partisan, with 71 percent of Democrats finding it positive and just 18 percent of Republicans doing so, though the key indicator is Independents, among whom 53 percent found it to be a positive thing. Addressing Florida’s economy, just 33 percent of respondents said they saw it getting better, with marginal differences by party affiliation. Central Floridians are least optimistic, while those in the southwest are the most optimistic. Still, slightly more Floridians overall think the economy is getting better, which has helped Scott. Among those who see an improving economy 65 percent give at least a little credit to President Barack Obama, while 82 percent credit Scott. “The governor needs to make voters believe he is responsible for a better economy. That’s the key to his electoral future. He isn’t going to get re-elected because he is Mr. Personality. He needs to essentially convince voters, ‘You may not like me, but I’m the guy who is making things better,'” Brown said. Quinnipiac University surveyed 1,176 registered voters from June 11 to 16, with a margin of error of plus or minus 2.9 percentage points. Who are these numbskulls that are buying the crap this con artist is shoveling? I’m stunned that ANYONE would view this guy favorably, Republican or Democrat. I guess that is why he keeps gutting education – he’s trying to create his own voter base. “Scott’s climb in the last year was characterized by a distinct shift left on some issues as he embraced a raise for school teachers, opposed tuition increases for college and university students, increased state spending to a record high” Doesn’t sound to me like he’s “gutting” education. All he did in the past year was give back a fraction of what he took away in the first part of his term. He threw a bone to the teachers to try to buy the support of that huge voting block in the election. Meanwhile, he has denied the tuition increase needed by the universities to function because it would upset the voters paying it (another attempt to buy off a voting block for 2014), and continued massive cuts and expensive unfunded mandates to local school districts. I think you’re confusing the federal stimulus money that went away, which the legislature didn’t make up. (Scott signs laws, he doesn’t make them), it’s hardly Rick Scott’s fault that the stimulus funding was temporary!… As far as tuition, I’m not sure anyone, other than perhaps you, thinks Colleges and Universities should be able to raise tuition rates at double the rate of inflation every year, in perpetuity and while you may call that “buying votes”, I’m pretty sure Scott campaigned on this very issue, actually delivering on campaign promises, used to be considered a good thing. Christ has a major identity flaw….he is clueless as to who he is. Add in his flip flop disloyalty issue to his principals and you end up with a dishonerable hack politician who is especially untrustworthy and unpredictable. I cannot see anyone trusting Christ in any government position. I’d say Charlie Crist knows exactly who he is…a moderate who is no longer welcome in the GOP, which is being held hostage to Tea Party extremism. So, rather than sacrifice his principals he sought out a political brand that is more welcoming to them. Perhaps if he hadn’t done a complete 180 on almost every one of his so-called core beliefs, your point might have merit. He sought out a political brand that HE THINKS is more welcoming to his chances at winning, that’s it. Would you rather have a candidate that embraces the party line, no matter how extreme and ridiculous it is, or would you rather have a candidate switch parties because the current one has moved so far away from his ideals that he doesn’t feel comfortable in it? Rick Scott is the notorious “wolf in sheeps clothing”. . . he is “playing” to some groups of voters to get re-elected. Please don’t be fooled to think he has changed. This terrible governor, and his pals in the legislature, need to go. . . the sooner, the better! I have to say that Rick Scott has got to be one of the slimmest politicians I have seen, no one can tell me that he wasn’t behind the internet cafes for his election funds, and then of course he rolled the blame over to his assistant Governor, and she took the fall for him. Once he milked the cafes dry he than demanded the legislators to close them down. Not that I ever was in favor of the cafes, I wasn’t; however, it is easy to spot a snake in the grass when you see one, and he certainly is one. I say we vote them all out, state and local politicians need to go!!!! May the wind be at your back, and may all of you be upwind of Rick Scott! 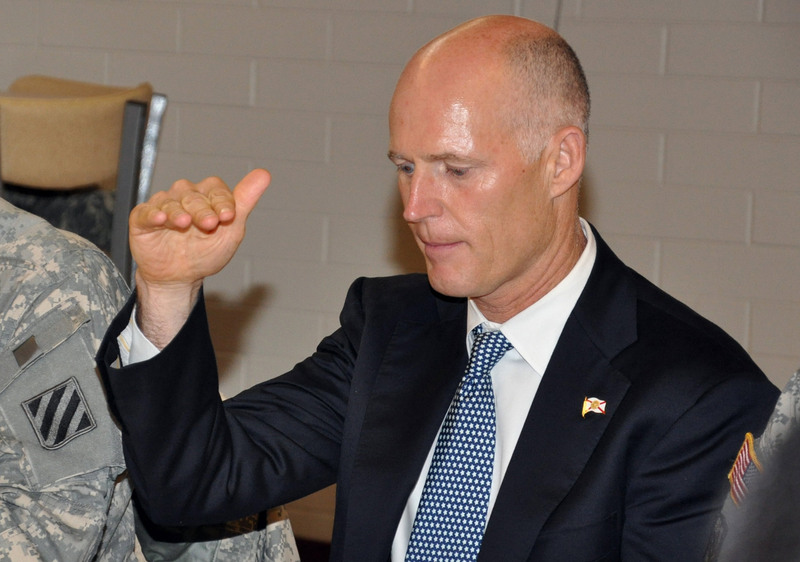 It’s been said that Rick Scott has a symbiotic relationship with earthworms…. Now I understand – EUREKA! Tell me: and doesn’t he look like a worm? Scott is a short timer. Best Governor since Bush. Bringing back fiscal responsibility.